Do you have a passion for rescuing 1) magical girls, who out of naiveness, unknowingly signed a no return life contract with ambiguous terms and conditions put out by certain cute furry akuma animal from unknown origin, thus having to spend the rest of their lives fighting spiritual enemies threatening humanity and in the process of fulfilling said bond, will eventually led to sorrows and despair and resulting in their ultimate downfall? And 2) People suffering from hangovers from too much parting the night before? If your answer is YES! and YES! The Singapore Morning Rescue Command wants you! We are recruiting! 1) Orange jumpsuit – One size only. L. Will fit rescuers that are 170cm-ish tall. 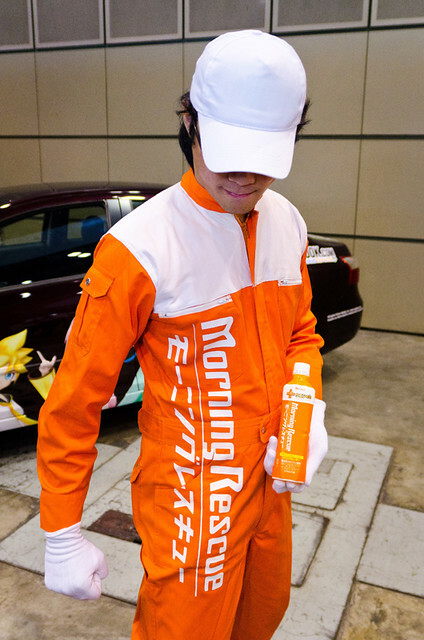 2) Morning Rescue decal on jumpsuit. All 3 items above totals S$90. Will require payment upon signing up so as to facilitate ordering of uniform and decal printing. 2) Must be able and willing to attend cosplay events in Singapore. 1) Must agree not to carry camera during rescue mission. Our objective is to rescue Magical Girls, not photograph them. However, rescue attempts been photographed by others is alright. This entry was posted in AFA, Cosplay. Bookmark the permalink. But yes it is hot even in air-conditioned places, especially moving around. Orange suit with number 1 to 5, gimme lucky number 1! Hi, I also live in the U.S. and would like to buy a Morning Lescue suit. Magical girls need lescuing over here too. My email is jayhawkanimefan@yahoo.com. Thank you! If you are still taking applicants,I’m interested in joining.Think the suit fits 180cm? Singapore actually,but couldn’t find the group you mentioned. Hi, sergeant gordon, I plan to cosplay as a Morning Rescuer here in the US at a convention, but I’m having a hard time finding the Morning Rescue decal. Is there any way I can buy just the decal from you? Thank you very much. Do you have any machine that is hot enough to iron it on? I have a regular iron, would that work? Would you be able to ship the uniform to the U.S.? I will gladly pay the $90 plus any shipping expenses that may arise. Hey I was wondering if recruiting was still going on and if you would ship to US? I would gladly pay it would just take a little while before I can order. Hello! I was also Woundering if you are still doing this morning rescue Stuff I live In Canada and would Naturally Pay the 90$ as well as any shipping to get it here I could order rate away! My Email is Jasonx790@hotmail.com Message Me back When You get A Chance. There Are Magical Girls To Be Saved In Canada! Hello, not sure if you are able to or still doing this but I’d be totally willing to pay the $90 plus any shipping costs to the US! I’m a Kyoko cosplayer and would have a lot of fun cosplaying Kyoko in a Morning Rescue suit, I think! 🙂 If you’re still doing this and could contact me at dogtierivory@gmail.com it would be super appreciated. Thank you! is it possible to ship us? usually i make my own but this looks too cool not to investigate. also, anyone know where to get MR online?